President Obama delivers his first State of the Union address against a backdrop of an American public anxious about the economy and lawmakers on edge about the midterm elections. CNN.com provides live updates of the speech. (CNN) -- 10:20 Address ends with Obama calling on Americans to "seize this moment -- to start anew, to carry the dream forward and to strengthen our union once more"
10:17 On discord in politics: "Democracy in a nation of 300 million people can be noisy and messy and complicated. And when you try to do big things and make big changes, it stirs passions and controversy"
10:13 Obama says he will work with Congress and the military to repeal "the law that denies gay Americans the right to serve the country they love because of who they are"
10:08 Obama says the threat of nuclear weapons is "perhaps the greatest danger to the American people"
10:06 Obama details the challenges in Afghanistan: "There will be difficult days ahead. But I am confident we will succeed"
10:02 Obama mentions Massachusetts special election: "After last week, it is clear that campaign fever has come even earlier than usual. But we still need to govern." He calls out Republicans, saying, "just saying no to everything may be good short-term politics, but it's not leadership"
9:59 Obama calls on Congress to publish all earmark requests on a single Web site before there's a vote "so that the American people can see how their money is being spent"
9:54 "We will not continue tax cuts for oil companies, investment fund managers and those making over $250,000 a year. 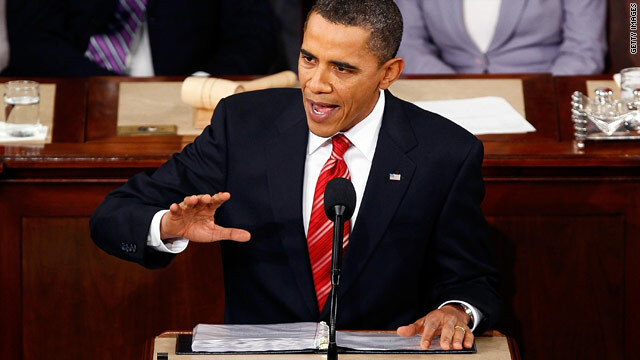 We just can't afford it"
9:48 On health care, Obama urges Congress not to walk away. "Not now. Not when we are so close. Let us find a way to come together and finish the job for the American people"
9:44 Obama gets more laughs: "By now it should be fairly obvious that I didn't take on health care because it was good politics"
9:37 Obama announces goal of doubling exports over the next five years, an increase that he says will support 2 million jobs in America. "To help meet this goal, we're launching a National Export Initiative that will help farmers and small businesses increase their exports, and reform export controls consistent with national security"
9:36 On climate change: "Even if you doubt the evidence, providing incentives for energy efficiency and clean energy are the right thing to do for our future -- because the nation that leads the clean energy economy will be the nation that leads the global economy. And America must be that nation"
9:34 On financial reform: "The lobbyists are already trying to kill it. Well, we cannot let them win this fight. And if the bill that ends up on my desk does not meet the test of real reform, I will send it back"
9:29 Obama urges the Senate follow the House's lead and pass a jobs bill, saying, "I want a jobs bill on my desk without delay"
9:27 On stimulating the economy: "I'm proposing that we take $30 billion of the money Wall Street banks have repaid and use it to help community banks give small businesses the credit they need to stay afloat. I am also proposing a new small business tax credit -- one that will go to over one million small businesses who hire new workers or raise wages. While we're at it, let's also eliminate all capital gains taxes on small business investment; and provide a tax incentive for all businesses, large and small, to invest in new plants and equipment." 9:23 Obama credits the creation of 2 million jobs with steps his administration has taken toward economic recovery, adding, "We are on track to add another one and a half million jobs to this total by the end of the year"
9:20 CNN's Candy Crowley observes: Always some good theater at these events. Obama talks about the taxes he has cut. No Republican stands to clap, and the president calls them out, "I thought I'd get some applause on that one"
9:18 Obama says the bank bailout "was about as popular as a root canal"
9:13 On the economy, Obama says "the worst of the storm has passed"
9:01 In holding room, Obama was talking with Sens. Lamar Alexander, John Cornyn and John Thune. He turned to the entire congressional welcoming committee and joked, "We just brokered a health care deal right here." 8:48 p.m. The president's speech is being written right up until the last moments, according to two White House aides, who say they have not seen a new draft since about noon today. An embargoed copy of the full speech was supposed to be released at 8:30 p.m., but there's no sign of it yet because of last-minute changes. Senior officials said the president's broad goal was to seize back the mantle of change by talking about the need for a "new beginning" between Democrats and Republicans that can restore trust in Washington. Along these lines, the president was to make what officials described as a passing reference to the special election in Massachusetts but would not have a "chastened" tone like Bill Clinton after the 1994 election. Instead, officials said he would use the election defeat as a way to challenge Republicans to meet him halfway on the major issues facing the nation. Officials said he would note that with Republicans now having 41 votes in the Senate, they can't just block everything. The first test will come next week when the Senate is expected to begin debate on a jobs bill. The president was to specifically try to sprinkle the jobs bill with small business and corporate tax cuts to win over some Republican votes and call their bluff if they do not come on board. While jobs and the economy were to make up the bulk of the speech, officials said health care would also figure prominently. But they noted the president would not get too specific on the path forward because key lawmakers want to take a deep breath on the volatile issue while ramping up much more time on the jobs legislation. -- Financial regulatory reform, which would give the president another chance to press Wall Street to change the rules of the road to prevent another crisis. -- Climate change legislation, where the president would specifically cite the work of lawmakers in both parties trying to broker a compromise. -- Education reform, where the president would push for an increase of up to $4 billion despite lean times for other key parts of his budget.